Richard Marggraf Turley moves us beyond the Scottish borders, to London, 1810. With endorsements from the Financial Times, the Guardian and the Irish Times amongst others, this novel explores a labyrinthine city of asylums, brothels and secret spaces, in which poets rub shoulders with pimps, and where the only constant is illicit desire. The rat crept along the wall of the burying ground in Portugal Street, where stinks and other odours of the dead were given off, before doubling back the length of Clare Market. Past the disreputable tavern with its ramshackle bays. The July air was even more unsustaining than usual, and he was no longer at his best … He gazed down at the silky patches showing through his coat. Still nimble enough, though. 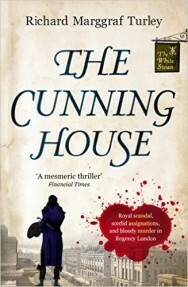 Filling his shallow lungs, he darted across the street for no other reason than to prove he still could, aware he’d needlessly drawn the eyes of a huddle of men cutting for guineas on the pavement, then slipped into the alleys and dark passages fanning out between Vere Street and Stanhope Street, the shortest way down to the river. Someone not far away was making a poor imitation of a blackbird’s call. On the Strand, Rat-man judged it safe to rear on two feet. He stepped into a shadowy doorwell to catch his wind. Above him, Venus and Mars were bright specks; he imagined the chill between planets, that unbearable space. But a body in motion was a body not yet cold – and there was work to do. The latest intelligence from France spoke of a munition so potent, wherever a man stood when it ignited was the centre; of grenades packed with chemicals that rendered soldiers irresistible to each other. It had always been the Frenchies. He remembered handing General Wolfe his gloves at Quebec after a day of clinging to rocks. Long ago now. France, a nation of barley and buckwheat eaters, moustachioed fawns and stinky women. He set off again, ducking at the corner of Somerset House into an ill-lit passage strewn with ashes and oyster shells. Above him, chandeliers flamed in a high gallery. Then he was on the river bank, pattering over loose pyramids of burnt clay tiles. The unfinished bridge towered ahead, its cunning interfrictions of iron and granite reaching out from either side of the river towards a deafeningly dark hole. Rat-man’s sharp eyes found the tiny entrance to the service tunnel. He flipped open his watch. He was early.